I’m finally recovered from our epic family vacation. Our sunburns have healed, and we’ve caught up on laundry and sleep! We saved up for two years to travel to Mexico and I’m so thankful we could give our kids some great memories. I’ve been doing this trip for as long as I can remember. We go to Guadalajara to spend time with family and then we drive to the coast to spend time on the beach relaxing. Sometimes we even invite our cousins to come with us. I definitely want my kids to know their culture and to know their cousins in Mexico like I did. I want this to be a tradition they look forward to every year or so. So we make it a priority to save and travel. This year the trip fell on Elias’ birthday. So I’m like let’s do a party! It will be a great way to hang out with everyone at once, have fun, and celebrate Elias. And man, it was an amazing party! A company came in and did two crafts for the kids. A piggy bank and slime. I mean you can’t go wrong with slime at a kids party. Amiright? There was also a bounce house which is the one thing Elias wanted, and he pretty much stayed in there bouncing away for the whole 5 hours. The food was amazing. Pozole, enchiladas, sopes, salsas, botanas, and it all ended with a churro bar. Yes two people came, made churros and gave us the option of our filling. So. Good. I’ve been thinking about those churros ever since the party. They were THAT good! Elias had such a great time. See didn’t it look it epic??? I’m so thankful to family who helped plan, and those who showed up. The next day we woke up early and made the 4 hour drive through the mountains to Puerto Vallarta. My father likes to wake up at 6am to beat the traffic. Most of the way through the mountains is one way both lanes, so if traffic slows down…everything slows down…or stops. So we wake up early to get a head start. We stop for lunch in a little town called Las Varas, and make it to Puerto Vallarta by mid-day, and I’m laying out in the sun by 2pm. The next few days are pretty much the same. Wake up, have breakfast, and head to the pool by 10am. We have no agenda…just to hang out. Elena spent as much time as she could in the pool. I spent as much time as I could in the sun. In the evening, we shower, and get ready for dinner. We head into town for a nice walk on the malecon. The malecon is a long strip with a lot of restaurants and shops, and lots of vendors selling street food. It’s right off the ocean, so we can see the sun set and hear the waves crashing as we walk along. It’s a really nice way to end the evenings. It was 5 days of having nothing important to do, but enjoy time together as a family. Now there are two hotels that I rave about. Hotel Melia is one of them. This is the second time we’ve come to stay at hotel Melia It’s an all inclusive resort that is really kid-friendly. They have different daily activities for kids all day! We can either drop them off all day, or drop them off for each activity they want to do; which is what we did. They picked one or two activities they wanted to participate in, and we would drop them off for that hour. They made kites, pinatas, cookies, swords, and played games. They even had a birthday party with cake on Elias’ actual birthday! The pool area also has games for the adults to participate in. I did water aerobics a few times, and played bingo mid-day. It’s really fun to listen to others participate or participate yourself. There’s quite a few activities for the whole family. I don’t think I would ever want to stay at another hotel with kids; it’s just so great. One activity that we splurged on was a dolphin and whale watching boat ride. Elias really wanted to ride a boat, and Elena really wanted to hang out with some dolphins. Win-win. We booked the wild dolphins and snorkeling eco tour for the four of us. It started with a marine biology lesson about the sea life we would encounter. Then we took the boat out to the ocean and started looking for dolphins. When we caught up to them, we could jump in to swim near them if they were in a curious/playful mood. At the last minute, Elias decided he didn’t want to jump into the water, so I stayed on the boat with him. After a few attempts to hang out with the dolphins, we realized they weren’t super playful that day, so we went to a little secret beach to look at shells, and other ocean life before heading back to the docks. Both the kids LOVED it, and say it was their favorite thing to do. I’m not a boat/ocean person, but seeing their joy and learning about the ocean was worth it for me. Our time of relaxation was over, and so we headed back to Guadalajara. With only some minor traffic in the mountains, we stopped at Tequila around lunch time. We didn’t stay very long to explore…or to have tequila, because the kids were exhausted. We made it back to the hotel and just chilled out. That evening I visited my abuela who had recently injured her hip. I’m glad I was able to see her, even if she won’t remember I came to visit. Our last day we went to el centro to buy some souvenirs, and empanadas. Success on both fronts. Walking around on a Sunday in Mexico reminds me of Chicago summers. There’s a relaxing hustle & bustle vibe, as everyone is enjoying time with friends or family. Especially during Holy Week (Semana Santa) people will travel to Guadalajara from other cities. I love it. On the way back, we flew Aeromexico. It’s a great airline, and it was a pretty smooth ride, even with two exhausted kids. Join the mailing list to be the first to know when there's a new collection launch, exclusive promotions, blog posts, and to get a behind-the-scenes look as Karina travels to capture work for new print offerings. Plus I share a new downloadable calendar each month for your desktop & your phone as a thank you for following along. Don’t miss out! Thank you! I'm so glad to have you here! I thought I’d make this post a little personal. I remember being in middle school and feeling self conscious about being Mexican. Specifically during the holidays. I guess that’s when I realized that my peers started to see me as being different. I wondered why someone would even ask me that, of course I celebrate Christmas. Why wouldn’t I? But they kept pressing. Well what do you eat? Tacos? Do you have a tree? What did you eat for Thanksgiving? I was young so I was just surprised and annoyed by these questions. However I wasn’t the kind of person who showed much emotion so I answered these questions and I kept my confusion to myself. It wasn’t until I was older and had kids of my own that I realized that the kid’s from my middle school years just didn’t have any understanding of other cultures. No one had told them the beauty of other traditions. They just knew or heard about a few differences and made assumptions. I was their way of satisfying their curiosity. I’m ok with that now, I just wish I had been a little wiser, and more secure in myself to answer their questioning. Again, I’d like to talk about how important it is to have conversations like this as a family. Conversations, not only explaining and talking through your own culture, but also exploring and appreciating other cultures in an uplifting way. If we want to shift the entitled, and elitist way of thinking then it has to start with us teaching and having meaningful conversations with our children. It’s their future that we need to protect. One that isn’t filled will shock and fear of the unknown, but one of unity, possibility, and excitement. Anyway I thought I’d share a few traditions we have as a family during the holidays. 1. Tamales: My grandfather used to spend all day making tamales. We would eat them for days. Even though he doesn’t make them anymore, we still have tamales for Christmas. We buy so many, and have them for leftovers for the rest of the week. I remember sweet tamales (strawberry & raisin) being a treat during the holiday season. 2. Chocolate caliente: Now this is my favorite thing ever. 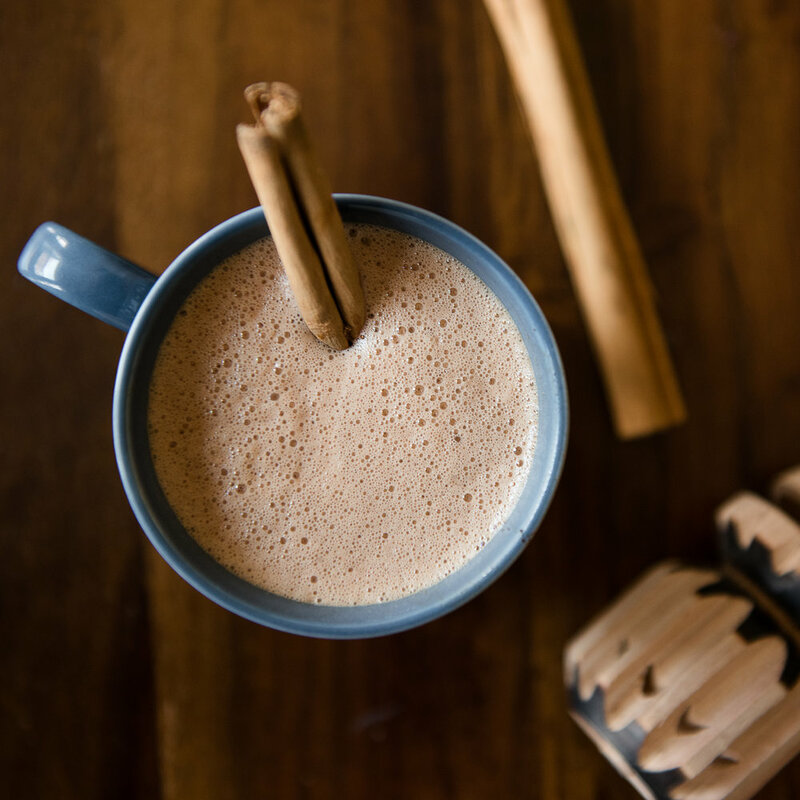 As soon as the weather starts getting chilly, the kids start asking for chocolate caliente. I usually make it when we decorate the Christmas tree and we have it as a special treat every so often. It’s always a little bit of a process because I like to get it frothy (like it should be). Having it with pan Mexicano is also a must. I’ve shared the recipe before if you want to try it for yourself. 3. New pijamas (or pajamas) and movie. We do this on Christmas Eve every year. The kids get to open one gift, which is a new pair of pajamas. They change and get cozy while I make popcorn and chocolate caliente, and we watch The Polar Express. Now I’d love to hear of any fun traditions you either remember and loved as a kid, or are starting with your own family. It’s so wonderful to see how people celebrate this special time with their friends and family. SO share in the comments below, or join the conversation on Instagram! Scheduling a trip to Mexico on the only free weekend I had in months was a crazy idea. Because I was only going to be there for a few days I tried to do all the things, while not really being tied to a specific schedule. Yeah…it made sense in my head…but as I write it out, it sounds a little silly. I had the pleasure of going with my father this time. We both had never been to Puebla Mexico, and it had been such a long time since he’d been to Mexico City, so it was going to be an adventure for both of us. I was so excited because it had been a decade since we’ve traveled together. We used to go to Mexico every year when I was in college, but since graduating it had been a while since we went on a trip together. This was the highlight of my trip. We really are good friends, and share the same sarcasm that makes us laugh. I did learn a few things from this trip that in the long run will be valuable for planning in the future especially if my purpose is to take pictures. I’ll share them with you. If it’s a short trip, focus on one place at a time. Since we only had 4 days, I had decided to do 2 days in Puebla, and 2 days in Mexico City. Well I realized, this is not enough time to really get to know a city. The first day I was just taking it all in. The second day, I planned a food tour with Rocio (if you don’t follow her, you’re missing out). She is a very knowledgeable food guide that also shares the rich history of Puebla. I was hanging on her every word all day, and was pretty stuffed by the end of the tour. I learned so much on this tour, but it also didn’t give me enough extra time to take pictures and spend time in each area. The same happened in Mexico City. The first day we explored around our hotel and walked for miles and miles around the center. The second day we made a trip to the pyramids and some parks. We hoped to end at this beautiful lake during sunset. The only thing I didn’t factor in was travel time and traffic. We spend most of the time in the car and didn’t get to do everything we wanted. So next time I’ll definitely spend more than 2 days in a city. 2. Stay in or near the center. In Puebla, we stayed about 20 minutes outside of the main town at Fiesta Americana Grand, a really great hotel. One of my favorites. However, the extra time it took to travel in and out was too much. I felt like I was missing time shooting due to travel. When I take pictures I like to be up and ready to shoot around sunrise. I take pictures for about an hour, and can go back to the hotel to shower and get ready for the day. This morning shoot time wasn’t easy with a hotel that was a drive out. While I LOOOOVED this hotel, staying close to the main center is something I’ll make sure happens next time. 3. Research before we go, but plan for a free day. I definitely did some planning for our time in Puebla. Like I mentioned above, the food tour we did was a great investment and will do it again when I go back. However, I should’ve planned for more time to explore and just wander around the city. Likewise, I had planned for too much free time to wander in Mexico City. I didn’t prepare enough ahead of time to know what I wanted to do. It wasn’t until I was there that I planned things to do on our second day. But by that time I felt like I was trying to plan too much, and ended up not being where I wanted to be when the sun set. At the end it’s a fine like between preparing and having time to just enjoy the city. These 3 things are great things for me to have learned. It will make the next trips even better. The time with my father was priceless. We really did have a lot of fun, and we learned a lot about Puebla, Mexico City, and the surrounding areas. We also learned a lot about our history and culture. I’m overflowing with information and can’t wait to share with you in the coming blogs! And if you’re not following me on insta…I share a lot more info, and a lot more frequently on there. Join the mailing list to be the first to know when there's a new collection launch, exclusive promotions, blog posts, and to get a behind-the-scenes look as Karina travels to capture work for new print offerings. If you've been around for a while you know I'm a photographer that has a passion for sharing my Mexican culture with others through beautiful, ready-to-hang prints for your home. However, I'm ready to go a little deeper. I grew up in the suburbs of Chicago. My mother stayed home with my sister & I, and my father worked his hardest to provide a great life for us. He is a self-made entrepreneur and has pretty much taken classes to do just about anything. If he didn't know how to do something, he went to school to learn. He taught me that education and knowledge are my greatest assets, and that I should never stop learning. While I'm obviously Mexican-American, it was always a tricky balance to be Mexican enough...but not too Mexican. Can anyone relate? Spanish was my first language, and my father always pushed me to speak it as much as I could. On the other hand, in school it was treated like a game. As kids shouted out words in english they would make me teach them the Spanish word. Over, and over again. Situations like this happened often. I know there are more people like me, who were raised in a Mexican home, but were pushed into the American culture as soon as they walked out of the house. It's hard to balance both, but I want to share my journey now as I raise bi-racial kids and help them navigate and be proud of their cultures. I am so thankful for my parents who gave everything for their children. My father keeps on inspiring me with his desires to learn and grow, as well as his constant flow of generosity with everyone he meets. He truly sees the maximum potential in people, and will do anything to help bring that out in them. My mother always made sure we worked to our fullest potential. She also built a safe home for us and encouraged us through every extra-curricular activity, and is now doing the same for my children. These values are what I want to share and pass on. While I'm going to enjoy sharing about Mexican traditions, family vacations, I'm going to love passing down lessons, and encouraging others based on how I was raised. My first encounter with racism was when I was 5. I was coming home on the bus from kindergarten. I had already found my seat, but the bus continued filling. A girl, a few years older came and sat down next to me. After a few seconds, she turns to me and asks, "Are you Mexican?" I nod my head yes. "Oh ok. My parents said I can't sit next to a Mexican," she said, as she got up to find another seat. I realize that that kind of thinking starts in the home. They learn from the examples around them. If I lead with kindness and love I know they will then treat others with kindness and love. I think it's so great for them to have my husband as an example of a white male who is supportive of who I am, with a humble, compassionate and understanding of his role in the world. He is able to help both my son and daughter navigate through life with a different perspective and awareness for the privilege they will have. Hopefully they will take both of our experiences and backgrounds to help advocate for others. I never thought I would be a homeschool mom. But here I am, the director of a homeschool community, talking to people for hours and hours about it. This is a part of my life that I tend to be more private about. I'll be completely honest and say that it's in some part because of guilt and shame. The homeschool community from what I know is largely white. I always saw it as something privileged, conservative, pretentious families did. It's been a journey for me to even be able to talk about this openly. When we had kids, my husband worked full-time, and I worked part-time as a wedding photographer. We still do. That means that I worked a lot of evenings and weekends. My husband works during the days. With that schedule, when the kids became school age, I would not see them very much due to our opposite schedules. That was the number one reason I decided to homeschool. Now that I've been homeschooling for 4 years, I've come to appreciate it, and really feel like it's an amazing opportunity that gives us a huge amount of freedom as a family, but also for the kids to pursue their passions individually. While I am a huge advocate for homeschooling, I also know that it's a privilege and not everyone has the same opportunities to do it. I think the most important part about having any sort of privilege is living through it with humility and responsibility. I hope my children use their education and talents to bless others. I know I still have a lot of preconceived notions to work through as a homeschool type-A, public school raised mom, but I want this to be a platform to be honest about our journey and encourage others who are on the same path. The arts weren't looked at as a career choice. Who else can relate to parents wanting them to go for an MBA or to become a lawyer or a doctor. I'm sure parents always have the highest of hopes and the best intentions, but as soon as I discovered photography, and was able to build a business with it, I knew this was my path. In the past year I've been wanting to shift the wedding photography business to something that gave me more flexibility with my schedule, and that also came from my heart. I communicate best with photographs and stories, so after going to Mexico for a workshop, I was energized and felt this responsibility to share my culture with the world. It's frustrating how Mexicans can be portrayed, especially when I grew up with such vibrant, relaxing, family-oriented, and beautiful experiences of Mexico and the people there. There are so many things in America that people don't realize have come from or at least been inspired by Mexico. I want to travel Mexico telling it's story through pictures that can then be brought into the home as an encouragement, a conversation starter, and something that makes you feel like home. As I take a deeper dive into my heritage I'll be bringing you and my family along for the ride. I'm excited for the conversations that will stem from this. As I move from Karina Mora Prints to Karina Mora I want to share more of who I am, and connect with other people who have had the same experiences as me, or who are trying to find their way along as they raise bi-racial kids. This is going to be an amazing time. Thank you for reading this, and I'm excited to connect with you! Leave a comment below and let me know what resonates with you. And if you're in the Chicago area maybe we can hang over drinks...or if you're in Mexico, tell me where you're from so I can visit you! My son Elias turned 5 years old on April 11th. Every year for my kid's birthdays I let them pick a theme, which is usually what they're really into that year, and I plan a big party around it. They LOVE looking at pinterest boards with me, and brainstorming ideas. This year, I was especially excited when Elias wanted to have a "Coco" themed birthday party. We saw Coco in theaters in November and I was actually surprised by how much he loved it. I was surprised because he was the kid who refused to speak Spanish at Spanish camp last year. He also doesn't like any Mexican food other than quesadillas and chips. So, when he himself decided on a Mexican birthday party I was like ok, I'm running with it, and going all out...within reason, of course. Elias had also asked for ONE specific thing for the party; a Coco cake. I usually make the dessert, but he really wanted one after seeing it on pinterest (thanks a lot pinterest) I knew I couldn't pull it off, so I ordered one from Pastel! Cakes and More and was blown away by how it turned out. Elias screamed with such joy when he saw it. I also asked my friend Veronica to make cake pops for favors. I just want to say these are the best cake pops I've ever had. I usually don't like cake pops, but these were amazing...and a perfect cake topper for the cake. Guacamole, agua de horchata, arroz, beans, quesadillas, barbacoa & carnitas from a local grocery store, and Palomas that Michael mixed toward the end of the evening. I worked hard to transform our living room to a space that felt like Mexico. I displayed some of my pieces on the wall, and hung papel picado across our ceiling. Elena helped me decorate one wall with the quote from one of the songs in the movie; "Our love for each other will live on forever" It was great. I also made a mural as the backdrop of the bridge from the movie between the land of the living and the land of the dead. It took me a few days, but with the help of my friend I think it came together nicely. At least Elias was impressed, which made it worth it. We had his friends over to break a pinata, and watch the movie Coco of course. They had a nice time hanging out and eating all the sweets they could get. We celebrated with family in the evening too, so it really was a day full of good food, celebration, and lots of love for Elias. This birthday was so great that Elias is already asking for a Coco birthday party for next year. © 2017 Karina Mora-Metts, all right reserved.